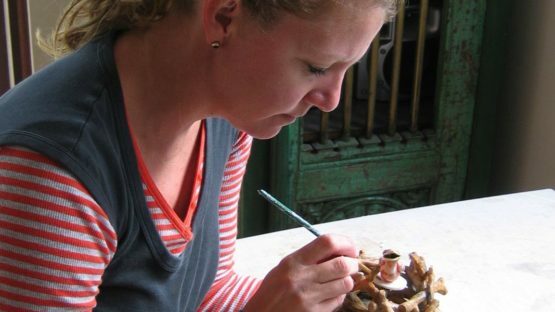 Being introduced to a world of art at the age of 10 by her mother, it wasn’t surprise that Amanda Shelsher also dedicated her talent and abilities to the same adventure. Her sculptures contain autobiographical elements, it almost seems that the entire character of the artist can be read just from observing her pieces. The artist was nudged towards art by her mother, but now, being a mother herself, she draws inspiration from her children. All the pieces are unique and created by combining slab and coil techniques. She later draws on her figures using sgraffito. Shelsher earned her BA in Visual Arts and Ceramics from Curtin University of Technology, Western Australia in 1991, and then went on to receive a Graduate Diploma of Education (Art being the secondary) in 1992, from the same institution. Watching Shelsher creates is wonderful scenery. She works from her home, while her two kids play nearby. Those are moments full of laughter and happiness. Chickens, rabbits and dogs all have their place in this big family. Watching her children play and discover the world feeds the artist with creative energy. Her work is also influenced by her love for the nature, something that she has passed down to her son and daughter. Her female forms have an autobiographical note, and are under influence of the artist’s observations of human’s instinct for nurture. These figures also speak of the Shelsher’s love for home life, for the domestic and her family’s feelings for the surroundings and the environment in general. Everything about Shelsher’s life and art could be summarized in one word – family. I already spoke of how big the inspiration her children are. We mustn’t forget about her mother, who allowed Amanda to create and nurtured her talent by enrolling her in courses and letting her study about art. Her father is also an artist (painter), and her parents are her biggest support. It is encouraging to see that someone can draw so much inspiration and energy from family. Not only that, but the viewers can feel all the love the artist is surrounded with as well. The artist knows that her children are central in her making of art. It was a huge change when they were born because and work evolved noticeably. It is only natural for her art to further change as the kids grow. As for the viewers, they can only wait to see where the future will take Shelsher and her sculptures. One thing is sure, though – those familiar feelings of love and nurture will continue to be central in her art. That’s just who she is. She is represented by 19 Karen Contemporary Artspace in Gold Coast, Australia. Amanda Shelsher lives and works in Inglewood, Perth. Images, including featured – courtesy of 19 Karen Contemporary Artspace.